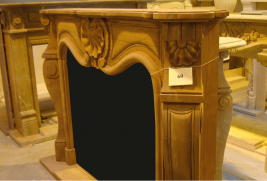 Today, you have many different fireplace mantels to choose from. You can opt for a British Colonial fireplace mantel, a French country mantel, an Art Deco mantel, or even a modern fireplace mantel. Despite all these choices, however, the traditional fireplace mantel is still one of the most popular choices. SoCal Fireplace Mantels is your provider of traditional fireplace mantels in Thousand Oaks. Traditional fireplace mantels typically have a simple design with white, brown, or brick materials. The lack of ornamentation allows your fire to become the focal point of the room, and highlights any ornaments or mantel clocks that you may wish to place on top. These fireplace mantels never go out of fashion, so you can enjoy your mantel year after year without worrying about making your home look dated. SoCal Fireplace Mantels is your Thousand Oaks traditional fireplace mantels provider. We offer a variety of traditional fireplace mantels in a number of materials, ensuring that you will find the ideal mantel for your home or business. Stop by our extensive showroom in Van Nuys or call to request a full color catalog and browse all of our options for traditional fireplace mantels. If you do not see a traditional fireplace mantel that meets your needs, one of our representatives will be glad to explain your options for ordering a custom traditional fireplace mantel. SoCal Fireplace Mantels strives to be your first choice as a Thousand Oaks traditional fireplace mantels provider. However, we also provide precast architectural products such as statues, fountains, gazebos, columns, and much more. Whether you need a statue or fountain for the foyer of your business or an outdoor bench or gazebo for your private garden, we have exactly what you need. We also offer a full line of fireplace accessories to complement your newly refurbished traditional fireplace. We are not only your premiere provider of traditional fireplace mantels in Thousand Oaks, but we also provide remodeling services to transform your old fireplace into a traditional masterpiece. Call or stop by today to find out about our entire range of services in Thousand Oaks.